The Parador of Vic-Sau is in one of the most beautiful areas of the region of Osona with the Guillerias mountains in the background and the Sau reservoir nearby. The peaceful surroundings are in contrast to the industrialization around the city of Barcelona. The hotel has the atmosphere of a traditional Catalan farmhouse with a well looked after garden, bedrooms with colonnaded balconies and a magnificent swimming pool. The rooms in the building are spacious and comfortable and the windows have exceptional views of the surrounding landscape. The Parador's restaurant serves international dishes and has a special gluten free menu however the speciality is local dishes. Anglerfish au gratin with ali-oli sauce. In the nearby town of Vic Sau, the places to visit include the Sant Pere Cathedral, the Roman temple, the main square with porticos and the episcopal museum. You might like to follow the 'Route of the Romanesque' by car. This goes through villages like Santa Maria del Corco and Rupit together with the Monastery of Santa Maria de Ripoll. Another trip by car is to the "serrania" (mountains) of Guillerias, visiting the dam of Sau and the volcanic area of la Garrotxa. These are places for walking, horse riding or going by mountain cycle. Like all Spanish towns, the local festivals are an important part of life. The first Sunday in May has the Penitence processions whilst the main 'fiesta' is on July 5th. A medieval market is held in early December. At the Vic-Sau Parador, there is a seasonal swimming pool. Locally there are water sports, golf and walking. 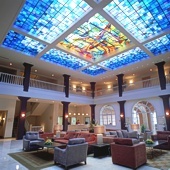 Reception of the Parador might even be able to arrange a balloon trip. An interesting walk is from the Parador to the Monastery of Casserres which is an outstanding example of Catalonian Romanesque architecture. The Parador Vic-Sau has twenty one twin bedded rooms, twelve rooms with double beds, four single rooms, four suites and one easy access room. All the rooms have a private bathroom and also a telephone, satellite television, TV canal plus, a safe and a mini bar. The hotel has air conditioning and central heating, garage and parking facilities (without security and limited places), currency exchange, lift, satellite television, free wireless internet, garden, seasonal swimming pool, a restaurant and bar. Facilities are available to hold business meetings. Distance from the nearest airport is approximately 61 kms, train station is 12 kms away and the nearest port is 74 kms away. Note: Access to the Parador is halfway between the towns of Vic and Roda de Ter. 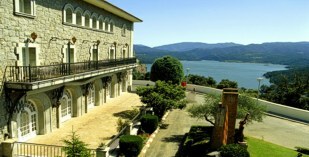 The Parador is located 14 km from the town of Vic, which it is not necessary to enter. From Barcelona, take the C-17 (formerly the N-152), and from Lleida take the C-25. To access the Parador you must stay in the direction of Girona on the C-25 until you reach the Vic-Est/Roda de Ter exit, and continue toward Roda de Ter. A few meters on you will see the sign for the Parador. From Girona, take the first exit --Vic-Est/Roda de Ter--and continue towards Roda de Ter and take the Parador turn-off. This was our first of three Paradores in our tour of Spain during the summer of 2014. The views were spectacular. An idyllic setting if you are looking peace and tranquility. The setting is "off the beated path" so to speak with access to a histroic Monestary. The reception was warm and welcoming and the room was a suite with sitting room, bath and bedroom. As the room was at the end of hall, it was quiet with superb views of the surrounding mountains. As it is located in the mountains, there is really no place to eat other than at the Paradore, though we only had breakfast, which was exceptional. 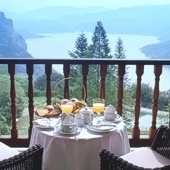 Of the three Paradores we visited, this breakfast was by far the best. We were allowed a late check out so we could use the pool in the morning which did not open until 11AM. i twould have been nice to use the pool for an early morning swim. All in all, we had a wonderful stay and would recommend this Pardore for those visiting north of Barcelona and the enchanting city of Vic. We stayed just one night en route from Murcia to the south of France. We received a warm welcome and an upgrade to a balcony room at the front of the hotel. The view from the room was magnificent particularly in the morning with the swirling mists. We had the taster menu in the evening but felt afterwards that we had been a bit pushed into making that decision as no other choice was offered - it was good but not fantastic. I wish we had had a little more time to walk and explore the area. A lovely hotel in an idyllic location but getting a little bit tired. I stayed in the Parador in July. My only issue was that all the road signs were for Parador Tourisme and I had written down Parador Vic-Sau. So I drove around and around very lost. By the time I arrived I was frustrated, irritated and upset. I had booked a room without a view and asked to change and for a fee, I was able to upgrade to a balcony. The second I sat down on the balcony all the tension of being lost floated away. I didn't want to leave the beautiful sunset even to eat dinner, so I just ate some snacks I had with me. The room was lovely, as was the bathroom. Like others have said, we would have liked a door on the toilet. I only stayed one night but could have stayed many more. Parador de Vic - Sau is a Catalan farmhouse now converted into a four star luxury hotel.